Although this 22 track album produced by Kjetil Bjerkestrand is not a strict collaboration by Magne and Kjetil they do work together on track 16 "Ein Strek - Nokon Fargar". This track features lyrics by Bj�rn Eidsv�g and vocals by Herborg Kr�kevik. The album is a soundtrack to accompany the animated feature film of the same title. The music on the CD is intertwined with extracts from the film in Norwegian. The cover of the CD features a picture from the animated film with title in white, yellow and red letters at the top of the sleeve. The left hand side of the reverse sleeve is yellow with black titles where as the right hand side is orange with black titles and another animated film picture. This three track promo only album sampler features the tracks: Ein Strek, Nokon Fargar - Herborg Krakevik (3:14) / På Slottet - Ole Edvard Antonsen (2:48) / Stabburs-Sangern's Klagesang - Bjorn Jenseg (1:18). 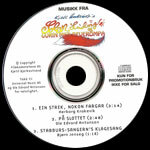 The disc is white with the title in blue, red and yellow at the top of the disc plus copyright and track information in the black at the bottom. There is also a white tipped red fox tail at the top of the disc. The disc doesn't come with an insert (tbc).